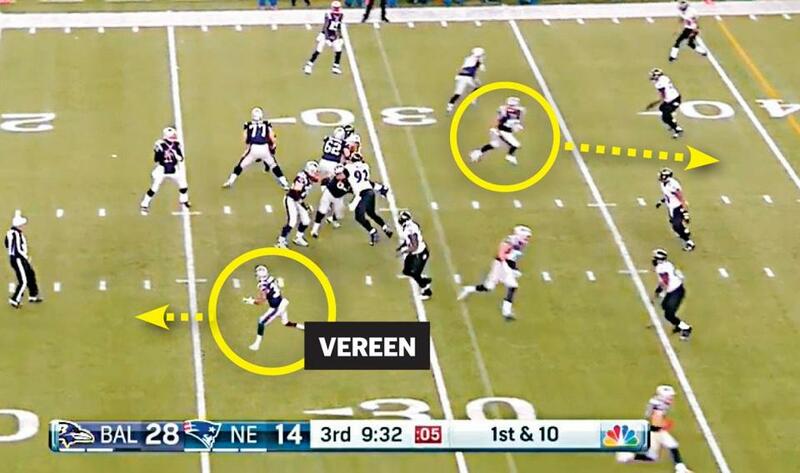 On this play vs. the Ravens, Shane Vereen lined up like a receiver but had actually declared as an ineligible receiver. If you can’t beat ’em, change the rules to stop ’em. That’s the message the NFL is sending this offseason as league owners prepare to vote on a bevy of proposed rule changes for the 2015 season next week at the annual NFL meetings in Arizona. Of the 23 rules proposals on the docket, one in particular is a direct response to the eligible-ineligible tactics the Patriots pulled out of their bag of tricks in their 35-31 win over the Ravens in January’s AFC playoffs. The proposal would allow any player who wears an eligible offensive number (1-49, 80-89) to line up in an ineligible position, but only inside the tackle box. And it would make what the Patriots did against the Ravens a 5-yard penalty. In that game, the Patriots used running back Shane Vereen as an ineligible player and lined him up as a slot receiver. The tactic confused the Ravens — who didn’t know which players to defend — on three plays, and helped the Patriots drive for a touchdown and cut their deficit to 7 points. Under the proposed rule change, if a player declares ineligible and lines up outside the tackle, he will be penalized 5 yards for illegal formation. While 19 of the 23 rule changes were proposed by teams, this particular proposal was made by the Competition Committee, which submitted four proposals in total. The Competition Committee is composed of nine league officials — owners, presidents, general managers, and head coaches — and Ravens GM Ozzie Newsome is one of the members. Rams coach Jeff Fisher, another member of the Competition Committee, said the proposal was made after hearing from several teams about the Patriots’ tactics. He said that by limiting the ineligible players to lining up inside the tackle box, it will bring some order to the game. “Unless we had some guidelines in place, this thing may get out of hand,” Fisher said. On the disputed play vs. the Ravens, Shane Vereen was ineligible and did not run downfield when the ball was snapped. This isn’t the first time the NFL will look to change a rule in regard to the Patriots’ tactics. After the 2004 season, the NFL started enforcing illegal contact penalties more strictly after the Patriots clutched and grabbed the Colts’ receivers in a playoff win. Of the 23 proposals to be voted upon, three come from the Patriots. One proposes that coaches use a timeout to call a challenge, no longer throwing the red flag, and that if a coach is successful on two challenges, he gets a third challenge. The Patriots also propose adding fixed cameras to the end lines, goal lines, and sidelines to aid in instant replay. And for the second year in a row, the Patriots propose moving the line of scrimmage for extra points back to the 15-yard line to make it a more competitive kick. 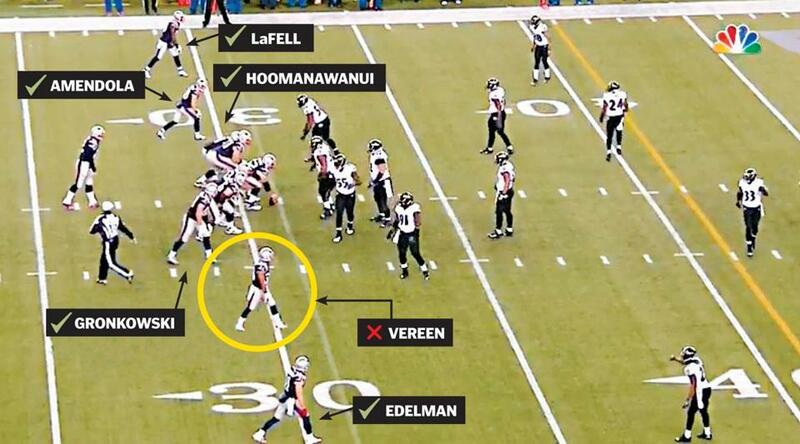 A 2-point try would still come from the 2-yard line under the Patriots’ proposal. The committee is submitting a proposal by the Lions that would allow the instant replay system to correct an officiating error. That would include such judgment calls as pass interference. Currently, no penalties are reviewable. Fisher made it clear that his peers wouldn’t favor such a change. The Redskins suggested increasing a coach’s number of challenges from two to three, regardless of whether he is successful on an early challenge. No proposals on the handling of footballs before games were made while the league awaits the Wells report on the Patriots’ use of deflated footballs in the AFC Championship game. Also, because teams are running out of permitted numbers for linebackers, the committee proposed allowing numbers 40-49 to be used for the position, along with 50-59 and 90-99. The owners will vote on all 23 rules changes near the end of the three-day owners meetings. A rule needs 24 of 32 votes to be passed. Material from the Associated Press was used in this report. Ben Volin can be reached at ben.volin@globe.com. Follow him on Twitter at@BenVolin.